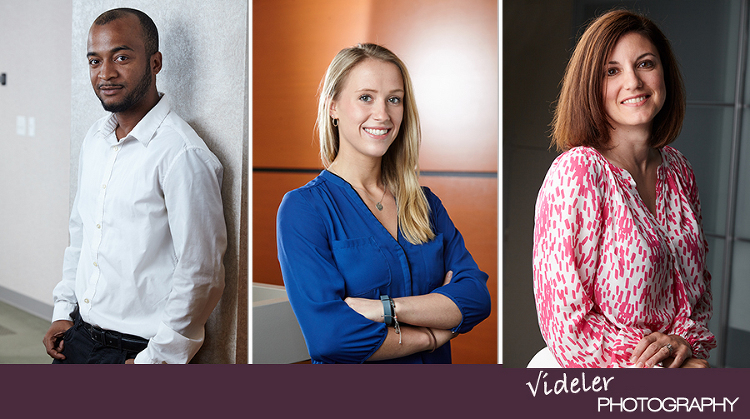 If presenting your business as a well tuned media machine is your goal, then professional portraits are a must. Professional location portraiture is one of the many services that Videler Photography provides. We bring lighting and reflectors and a very creative approach to capture high quality images. Most shoots are shot tethered to a computer so either the subject or the director can view and make changes as the shoot takes place. Companies use the images for website and marketing materials such as press releases, brochures and email announcements. 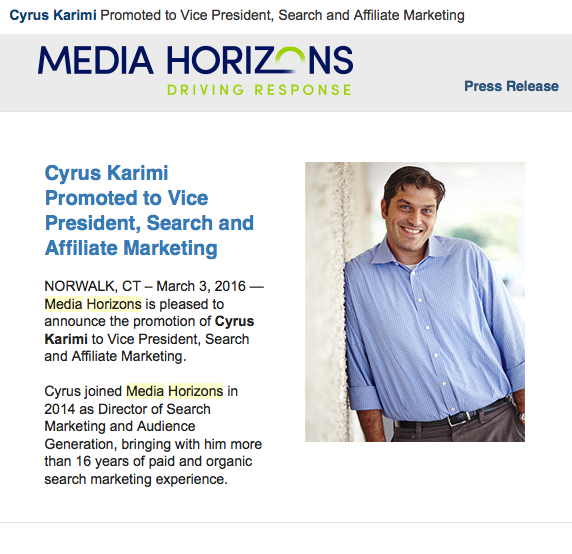 Above is an example of a press release used by Media Horizons, an agency located in Norwalk, CT. Like all shoots that we do, it is very important to make the subject feel relaxed and approachable. Backgrounds and lighting are as important as making the subject feel relaxed. I always look for a unique background. But in some cases, depending on what the client asks for, we might have to use something simple, like a white wall. 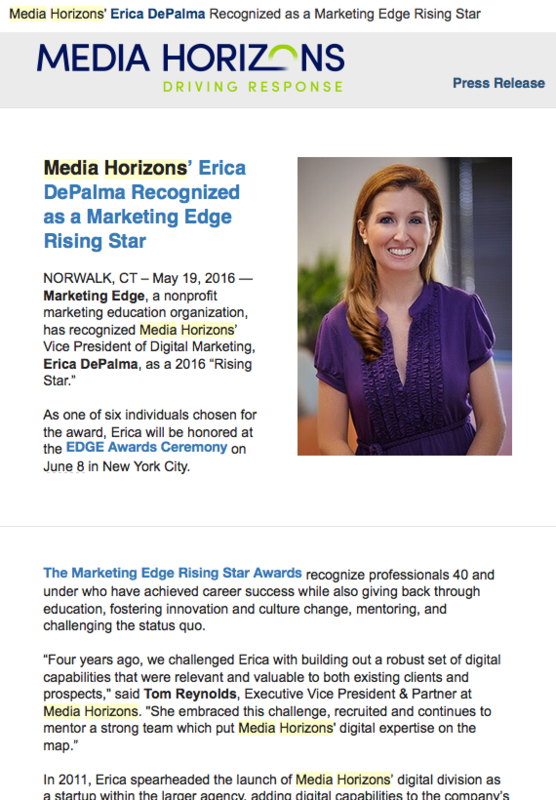 Another example of a press release with a professional portrait by Videler Photography. Every business should use a professional photographer to capture their people and showcase the work that they do. A beautiful portrait is the gateway to your companies brand and a well respected brand, should start with excellent photography. I even think people such as tree service, roofers can use aerial footage showcasing what they do. I even incorporated the drone into my wedding and event shoots and the response has been very good. It is easy to fly, but it took a good year to get all the turns and controlled spins down so the shoot would look appealing. Confidence is the key to droning and you must take chances to get the right shot. One of my favorite things to do is pick a spot and get a real nice image of it. I feel the artsy shots from the air would make real nice wall art for homes and or the office. I have just begun printing large format images from the aerial shots and will frame them for the client. I will talk to Dovecoat and a few other boutiques about selling these. I had a client reach out to me and asked if I could get a shot of the light house off Cockoene Island so special requests can be made. If interested in some aerial images of Westport or if you have a request, I would love to hear from you. Old Mill Westport, one of my favorite hangouts. Don’t worry. This is the way I dress when I am casual, I promise to honor the dress code. A drone shot from a recent wedding at Shorehaven Golf Club. This was my first time at the newly renovated Shorehaven Golf Club, and they did an amazing job with the remodel. There’s no better location for a wedding photo shoot than a golf course because it is always kept in beautiful condition for the golfers, and therefore the photos always look great. Another part of the renovation that I love is a spacious new patio that makes walking around and taking great candids of people socializing and having fun effortless and enjoyable. We also used the drone for the first time at a wedding, incorporating both video and photography to capture overhead shots. I had a great time shooting the wedding itself and the party that followed, and everyone had a lot of fun celebrating the newlyweds. When clients first come to me with a job, I always offer an in studio consolation and photo shoot. This is a way I like to make sure that the clients are completely comfortable with me when it comes time for the day of the actual event. In this case, the event was Lauren’s Bat Mitzvah. We started the day at Temple Israel where I used studio lighting techniques to produce the best photos in the time before the service. After the service, which wasn’t allowed to be photographed, I went to Mora Mora, a lounge in South Norwalk for the reception. I arrived early to take pictures of the setup and design, which was done by Arlene Rosenthal. Arlene and I go way back, and I’m always amazed by the fabulous work she does planning parties. Once Lauren and her friends and family showed up, the fun really began. There was music, dancing, and even a man dressed up as a larger than life robot, who would shoot lasers and get everyone onto the dance floor. Shari and Jeff were married at The Dolce in Norwalk. I have been at Dolce before, but back when it was a GE office complex and we would photograph brides on the premises. This day was too rainy and cold, but in the past we would shoot the bride in a bunch of different places on campus. One was a little island in the middle of the pond, another was a barn at the entrance of the property and another was the building itself, which has a nice rustic and sometimes modern effect.For many years, I have known Hazel, the banquet manager . Hazel used to work at The Silvermine Tavern, home of the sticky buns, the best buns in the universe. Now she is is leading the bride and groom through Dolce, a very nice venue. To the delight of all of the guest, the party continued upstairs where they were able to socialize, wind down and play some pool. Great night.